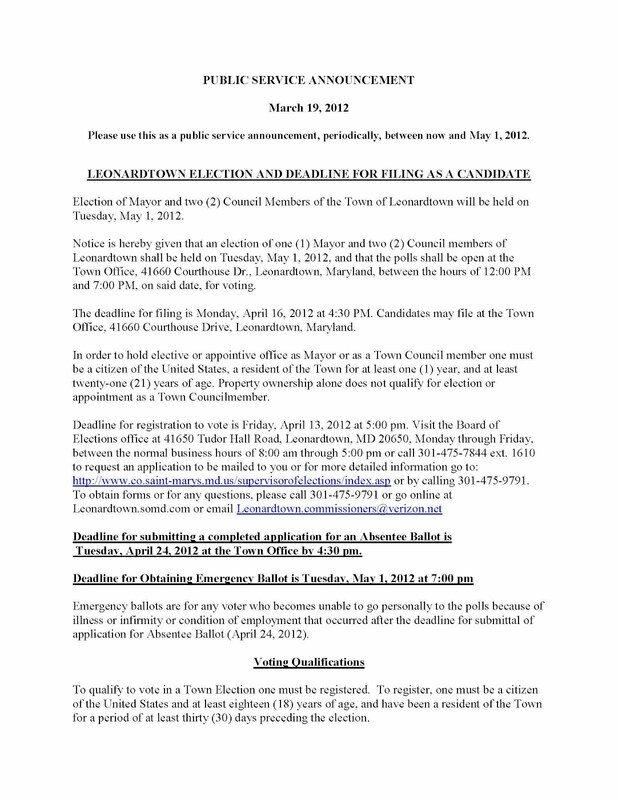 Election of Mayor and two (2) Council Members of the Town of Leonardtown will be held on Tuesday, May 1, 2012. 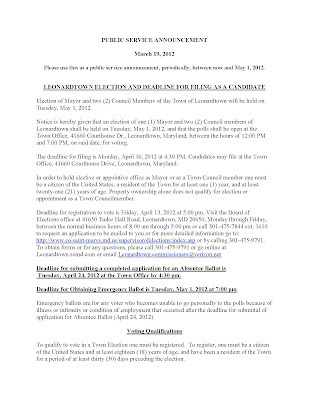 Notice is hereby given that an election of one (1) Mayor and two (2) Council members of Leonardtown shall be held on Tuesday, May 1, 2012, and that the polls shall be open at the Town Office, 41660 Courthouse Dr., Leonardtown, Maryland, between the hours of 12:00 PM and 7:00 PM, on said date, for voting. The deadline for filing is Monday, April 16, 2012 at 4:30 PM. Candidates may file at the Town Office, 41660 Courthouse Drive, Leonardtown, Maryland. In order to hold elective or appointive office as Mayor or as a Town Council member one must be a citizen of the United States, a resident of the Town for at least one (1) year, and at least twenty-one (21) years of age. Property ownership alone does not qualify for election or appointment as a Town Councilmember. Tuesday, April 24, 2012 at the Town Office by 4:30 pm. Emergency ballots are for any voter who becomes unable to go personally to the polls because of illness or infirmity or condition of employment that occurred after the deadline for submittal of application for Absentee Ballot (April 24, 2012). To qualify to vote in a Town Election one must be registered. To register, one must be a citizen of the United States and at least eighteen (18) years of age, and have been a resident of the Town for a period of at least thirty (30) days preceding the election. Comedy Night at Leonardtown Volunteer Fire Dept.